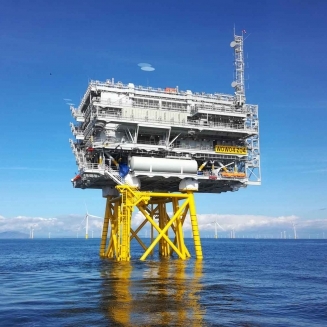 Smulders was responsible for the construction of 2 topsides and 2 jackets for the Walney Extension Offshore Wind Farm. Both topsides, standing 35 metres tall and weighing in at 2,900 tons were accompanied by its 48-metre-high jacket foundation and left the yard in Hoboken in March. The Walney wind farm in the Irish Sea, 19 km off the coast of Cumbria, already comprises two substations. It is currently being expanded to include two additional substations, making it the largest offshore wind farm in Europe. It will supply green power to 600,000 families in the UK, with the expansion due to commission in 2018.